Dream of the ancient cities of the Middle East, and chances are, you will picture large extravagant palaces, curved, domed architecture and the occasional flying carpet. Think Aladdin! But the clearest image that will come to mind is that of an open air market. Located in the center of town, it is filled with the hustle and bustle of merchants peddling their wares, elders swapping stories and people browsing and bargaining for goods. Believe it or not, Eastern Market, located in Washington DC, is just this kind of market place. It contains all of the hustle and bustle of an open air trading bazaar, yet it is suitably integrated into its Southeast DC neighborhood. At this sprawling marketplace, come enjoy fresh food, snacks, art work and music while experiencing a unique slice of DC culture. The heart of the market is located on 7th St SE between North Carolina Ave SE and C St SE. On the weekends, the street is closed to traffic and vendors set up tables one after the other under shaded awnings to peddle their wares. Of particular interest, keep an eye out for Anthony Reddix and his giraffes, woven from strips of aluminum cans. Expect to see elaborate paintings, intricate carvings, and detailed weavings for sale. Prices are generally fixed and not open for negotiation. Don’t be surprised if you run into musicians playing on the street corners. I heard a fantastic blues guitarist and an energetic saxophone/ clarinet jazz duo. 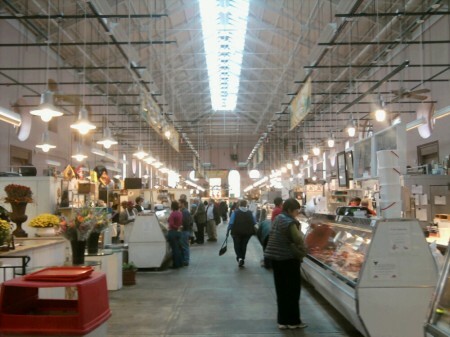 Food and fresh produce can be found inside of the large Eastern Market building, which serves as an indoor market place. Fresh produce, pastries, seafood, cheese, and an unusual selection of meat and poultry is offered here. When I say unusual, I am referring to the pig ears, feet and stomachs I saw in one booth! Chicken feet can also be bought here too. The stores, shops and restaurants located along 7th St also contribute to the unique atmosphere of Eastern Market. There are plenty of places to eat, enjoy a cup of coffee and grab a beer, as well as some unique shops that bring the flea market tradition indoors. “Clothes Encounters of a Second Kind” is a women’s consignment store that sells high quality, used clothing. It was hopping when I poked my head in! “Capitol Hill Books” is a quirky, used book store that is worth visiting if for no other reason than to admire its floor-to-ceiling stacks of books upon books! This place is crammed with a wide variety of titles, including a foreign language section in the bathroom and a cooking section in the kitchen. With the exception of Monday, Eastern Market is open every day of the week (Tues- Fri 7 a.m.- 7 p.m., Sat 7 a.m.- 6 p.m., Sun 9 a.m.- 5 p.m.). Every Tuesday features a farmer’s market from 3 p.m.- 7 p.m. Eastern Market is at its biggest and best on Saturday and Sunday when it hosts its outdoor flea market, and this is the best time to visit. Metro: After taking the Mason to Metro bus to the Vienna Metro, hop on a train headed in the direction of New Carrolton. From there, it’s a straight shot down the orange line until you reach the Eastern Market Metro stop, and Eastern Market is located several blocks away from there. A round trip will cost you around $10 and take you about an hour and a half from campus. Driving: Eastern Market is about a 35 minute drive from campus. Metered and unmetered parking is available beside the street, but finding a space is hit or miss. Experience all of the energy and excitement of an outdoor trading market right here in Washington, DC. Eastern Market offers fresh food, intricate crafts, music, culture and a great way to spend a weekend day.